Copyright ©2001-2019 Tuner Information Center. Permission is hereby granted to quote our text so long as proper credit is given. eBay listings that quote us incorrectly or without credit may be terminated without notice. Tuners are listed alphabetically by manufacturer and in alphabetical and numerical sequence by model number. In parentheses after the model number are the year of introduction and most recent list price, and/or the original list price if indicated by "orig" (special thanks to David Rich of The Audio Critic for copies of historical material from his reference library). Please see the On-Deck Circle for tuners that we know very little about or that we're not sure merit a writeup. We have posted updated eBay sale price data in this section through December, 2009; data for "as is" or damaged tuners, or otherwise unrepresentative auctions, may be excluded. The FM-AM T-100 was made by Kensonic Laboratory, a company started by former Kenwood engineers in the mid '70s to compete with the likes of McIntosh, and distributed in the U.S. by TEAC (unfortunately this ad isn't legible). The T-100 has a 5-gang front end and is reputed to be a better performer than their less-expensive T-101, but we've never compared the two. The T-100 uses linear phase LC IF filters that can't be replaced, and you wouldn't want to because it has excellent selectivity in stock form. It has above-average sensitivity and audiophile-type build quality in the discrete output stage, which most feel results in great sound. Specs were excellent for the time period, as might be expected, and if properly aligned, the tuner should even hold up reasonably well in today's more-crowded FM reception environment with regard to image rejection, adjacent-channel selectivity, etc. 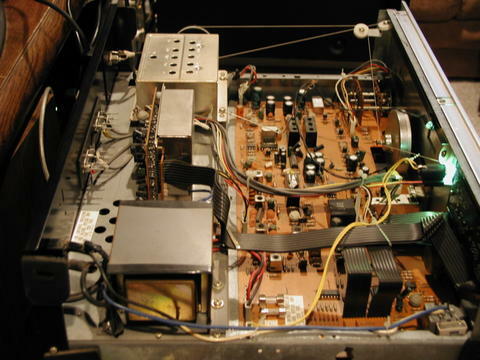 The Accuphase catalog linked above contains a detailed technical description of the T-100, including a paragraph on the "15-stage linear phase filter in FM IF circuit." The catalog devotes a paragraph to the T-100's "low distortion AM tuner" and our contributor Bob S. adds, "The T-100 has quite a sophisticated AM section, with a flat-topped IF filter, and a separate haystack filter for the tuning indicator." The T-100 generally sells for $400-600 on eBay, but as high as $750-900 is possible for particularly nice ones. The all-time high was an excessive $1,025 on two occasions: in 9/05 for a nice T-100 with manuals, but no wooden cabinet, and again in 4/11 for one with no cabinet, no manuals, but an original box for whatever that's worth. The T-101 is an excellent-sounding FM-only tuner that has good selectivity in stock form and a pretty sensitive 4-gang front end. It has wide and narrow IF paths, but it uses linear phase LC filters that would make modifications difficult. The T-101 is probably better suited to audiophiles than to DXers, who can get better selectivity from a less-expensive tuner modified with narrow filters. Our contributor Thrassyvoulos says, "My T-101 has the best macrodynamics and imaging of all tuners I've had, but is definitely too bright." The T-101 usually sells for $300-400 on eBay, but as low as $250 and up to around $500 are possible. The all-time high was $600 in 4/04. Pricey, very rare and reportedly superb FM-only digital tuners. If you've used any of them, please post the details in our FMtuners group. An Australian T-105 sold for $914 on eBay (we misplaced the date), and T-108s sold for $1,025 in 9/02, $1,026 in 7/04 and $1,200 in 12/07. The rare T-106 is a nice-looking FM-AM digital synthesizer tuner that sounds better than almost any other digital on strong signals. It has 6 gangs and 5 ceramic filters, 14 station presets, a multipath meter, high-frequency filter and wide/narrow IF bandwidth selector, but strangely lacks a stereo-mono switch. On weak signals, in a side-by-side test, our panelist Eric's all-black T-106B (borrowed from our tuner benefactor Kevin) was not as quiet as a Kenwood 600T or KT-917, or a Sansui TU-X1. In addition, this T-106B's selectivity did not live up to its excellent published specs. It may have been out of alignment, or maybe just a bad piece - our panelist David "A" has owned several T-106s and has found its quality control to be inconsistent. Our contributor Glenn compared one T-106 to his Yamaha T-85 and Sony ST-J75 and decided that the T-106 is the best tuner he has owned to date: "It simply 'sings.' Definitely what FM is all about. While I'm not much of an AM listener, the T-106 is clearly also a cut above in its AM abilities. Does as well on AM as it does on FM. A superb tuner." T-106s sold on eBay for $670 in 3/02, $758 in 6/03, $1,166 in 10/07 and $548 in 12/09. 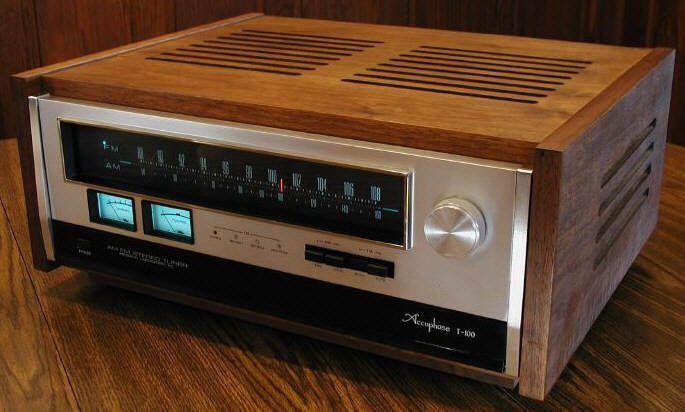 The very rare FM-only T-107 might have been the best of the series of excellent digital tuners from Accuphase, at least until the T-1000 came along. Our panelist David "A" thought that the T-107 was, along with the Tandberg 3001A, "the high-water mark for varactor-based tuners. I have had two T-107s that are significantly quieter than the T-106, and I find that the T-107 can perform on a sonic level with tuners like the KT-917, for example, so they are quite good. They don't have quite the RF performance of a KT-917 but they aren't bad, either." The black version is also known as the T-107B. Two T-107s both sold for $575 on eBay in 9/03 and 11/04 and others went for $855 in 11/05, $441 in 10/07 and $498 in 8/08. Users of the T-109, a very high-priced FM-only digital tuner, have differences of opinion almost as extreme as Sumo Charlie users. Although we know of one respected audiophile who thinks the T-109 sounds like a "cheap pocket radio" (perhaps his was out of alignment), several contributors say the T-109 and its redesigned successor, the FM-only T-109V, are among the best-sounding digitals. The T-109 and T-109V both use a pulse count detector like several top Kenwood tuners and, when properly aligned, are sensitive and highly selective. There seem to have been different versions of the T-109V, one with a balanced mixer and one without (and perhaps other differences as well). The current Orion Bluebook adds to the confusion by listing the T-109V as a 2003 model tuner ($2,200 list), even though the first T-109V apparently came out in 1999 and was listed in an older edition of the Bluebook. See how one T-109 and one T-109V sounded compared to other top tuners on our Shootouts page, and read our panelist David "A"'s Ricochet on the T-109V. T-109 sold on eBay for $1,200 in 1/03 and $1,453 in 5/07, and the only T-109V we've ever seen offered on eBay in the U.S. sold for $2,247 in 12/04 (one sold for 2,210 Euros, or $2,700, on eBay-Germany in 2/04). The two tuners' specs (which are identical) are available at the Accuphase site, which also has a wonderfully detailed writeup on the T-109V. Our contributor Dana offers this review: "Out of the box, one has to be impressed with the incredible build quailty of this and all Accuphase products. 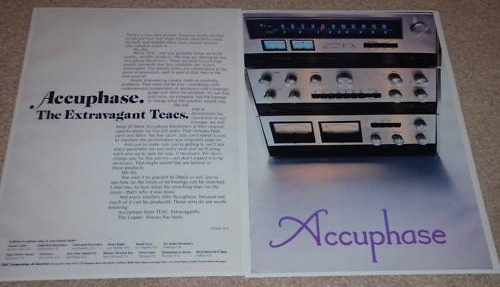 Having owned the T-100, T-106 and T-108 tuners and the E-202 integrated amp, I've had exposure to the wonderful build of Accuphase components. The T-1000 has a 5/8-inch aluminum faceplate that is sure to impress the neighbors, if that's your ilk. Weighing in at 26 pounds, this piece of eye-candy is still a lightweight compared to the TU-X1 at 34 pounds. The T-1000 stands at 5-1/2 inches high versus the 7-1/2 inches for the TU-X1, certainly more adaptable to existing audio stands. From an ergonomics perspective, this tuner doesn't overwhelm you with buttons and switches. It provides 16 small preset buttons that allow a total of 32 presets, with each button responsible for two station memories. Five small buttons provide muting, mono, MPX filter, frequency trim, and memory setting. A large tuning knob and power button complete the layout. Under the front glass faceplate is a signal-strength meter, station memory number, and reception frequency. The gold plastic remote control duplicates the same button selection with additional up and down tuning buttons. So how does it perform? Well, from an audio perspective, it's quite impressive. I've not had the opportunity to listen to its predecessor, the T-109V, but with a strong signal, the T-1000 has the ability to provide a remarkable wide and deep soundstage, with deep palpable defined bass notes. Effortless highs are noted with a nice textured voice portrayal. Having owned the T-106 and T-108 at different times, I can say that this is a different breed of cat. I found the overall sound presentation of the earlier tuners to be quite thin and without real depth of soundstage. The T-1000 has the uncanny ability to separate and place mid and bass notes that I haven't experienced before with other tuners, such as the Sansui TU-919 or TU-X1. Again, from an audio perspective, this tuner performs in spades. Unless, of course, the MPX filter becomes necessary with noisy signals, then the highs become a tad rolled-off. I mention this because this tuner is not the most sensitive tuner I've experienced. Signals that the Kenwood 600T and the TU-919 and TU-X1 have no problem dealing with, seem noisy with the T-1000. A DXer's friend it is not. I'm disappointed that WCRB, the classical station out of Boston, seems to contain a background hiss that my APS-9B antenna can't eliminate. But other local stations provide a strong signal that brings out the best in this tuner. If you're an audiophile with a system that can take advantage of the T-1000 as a source, this tuner might be your FM nirvana." Here's a follow-up from Dana: "Having owned the Accuphase T-100 for a decade, and now the T-1000 for a few months, I can say the aligned and modded T-100 had a definite edge over the T-1000 in the sensitivity department. That said, however, the T-1000 is no slouch. Better than most but not in the same league as the TU-X1, KT-917, T-85, 600T, MR 80, etc. A tad disappointing, nonetheless, especially for the entrance fee. I'm sure there must have been trade-offs in the design and manufacture of the T-1000 to assure true audiophile sound, at the expense of sensitivity. From an audiophile perspective, the T-1000 is heads above the TU-X1 and any other vintage tuner I've owned, including the AH6731, TU-919, CT-7000, MR 80, etc. The quality of the bass note and the extension of the highs is apparent, especially when used digital out to a DAC." Read our panelist David "Anonymous"'s review of the T-1000 on the Ricochets page. Read our panelist David "Anonymous"'s review of the T-1100 on the Ricochets page. Adcom - Only one of our panelists has ever used an Adcom tuner or tuner/preamp (he wasn't impressed with the sound of the GTP-500), but our impression (supported by reviews by Stereophile and others, and some sketchy anecdotal evidence) is that they're decent-sounding on strong signals but not particularly sensitive or selective. We'll list many of them below, but with so many better vintage tuners available in the used market, why bother with Adcom? If you've used any of them and would like to rebut the foregoing, please post the details in our FMtuners group. The GFT-1 usually sells for $60-100 on eBay, with a low of $30 in 8/04 and a high of $162 in 5/04 (when two newbies ran up the price from $102). The GFT-1A may be the Adcom tuner to try because it has three IF filters, while most or all other Adcoms have two. The GFT-1A usually sells for $40-60 on eBay, with a low of $20 in 8/08 and a high of $199 in 4/04 for one with wood side panels. The GFT-2 usually sells for $30-50 on eBay, with a high of $114 in 7/08. The GFT-555 usually sells for $30-50 on eBay, with a low of $22 in 10/08 and a high of $202 in 8/08 as two guys ran it up from $70. The GFT-555II was available with a white face as well as the typical black. It usually sells for $60-120 on eBay, with a high of $250 for a mint one in 7/08 that seduced a newbie bidder. The GTP-350 tuner/preamp usually sells for $80-120 on eBay, with a low of $66 in 11/08. 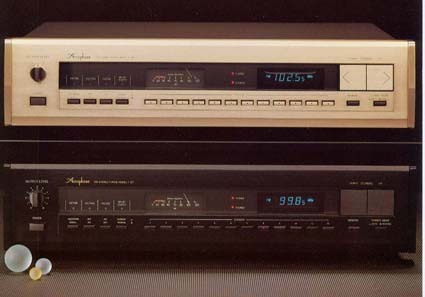 The very common GTP-400 tuner/preamp was available with a white face as well as the typical black. It usually sells for $60-125 on eBay, with a low and high of $50 in 7/08 and $200 in 6/09 for black ones. A white one in mint condition went for $300 in 12/07. The extremely common GTP-450 tuner/preamp usually sells for $80-150 on eBay, with a low of $62 in 8/08 and highs of $305 in 3/06 and $250 in 9/07. Don't overpay like those guys did. 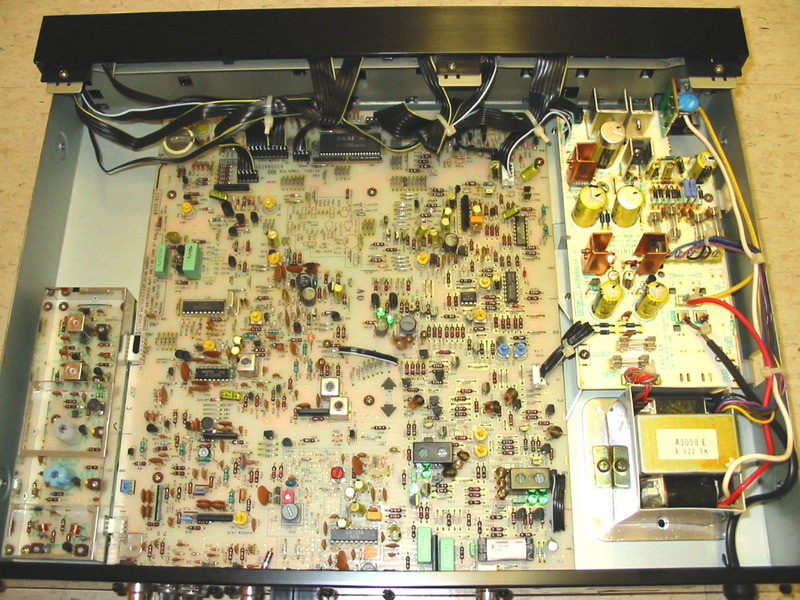 The very common remote-controlled GTP-500 tuner/preamp is sometimes found with a silver face, as opposed to the typical black. It usually sells for $180-265 on eBay, with lows of $102 in 7/07 and $117 in 11/08. The fairly common remote-controlled GTP-500II tuner/preamp was available in black or silver. It usually sells for $150-265 on eBay, with lows of $66 and $76 in 6/08. Surprisingly, we don't know much about the very common T2 Atelier except the basics. The front panel has 16 presets, Seek, Mute, High Blend and Stereo/Mono controls, and one surprise: a fine-tuning control. 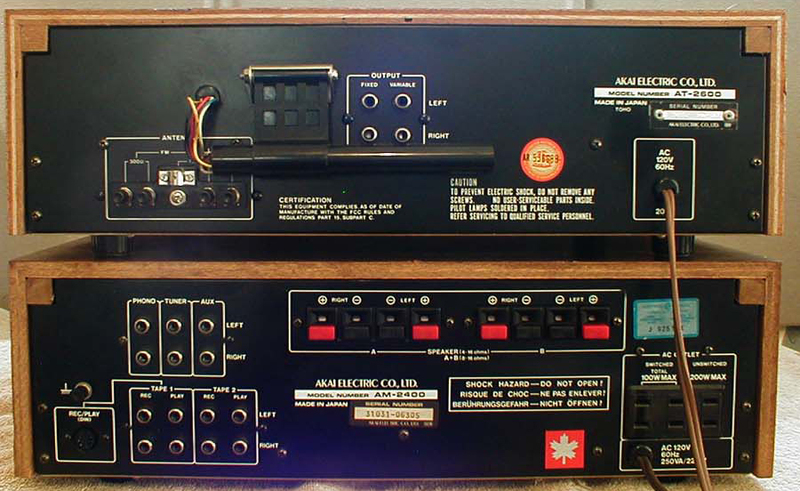 In addition to the usual antenna connections and RCA output jacks, the back panel (strangely enough) has three AC outlets! Please post in our FMtuners group if you have ever used this tuner. It usually sells for $60-100 on eBay, with a low of $30 in 10/08 and occasional highs around $160. The very rare 5-gang, FM-only AT-9700U is probably the only worthwhile tuner ever manufactured by Aiwa. Our contributor doug s. tells us that the AT-9700U "has features like wide/narrow bandwidths, two hi-blend levels, auto-lock tuning that can be disabled by slight off-center tuning, multipath meter, variable/fixed outs, nice center-tune indicator with arrows indicating you're off-tuned when not centered, and a nice digital readout, as well as a lighted tuning indicator on the analog dial." doug adds, "top notch sonics, good sensitivity/selectivity, and one of the most ergonomically pleasing tunas I have ever used." Our contributor Eli describes the tuning and multipath meters: "The meter has 10 LED segments that show signal strength. Immediately below those LEDs (in the same window) are three more LEDs for center tuning. A rotary switch changes the 10 segment display from signal strength to multipath indication." 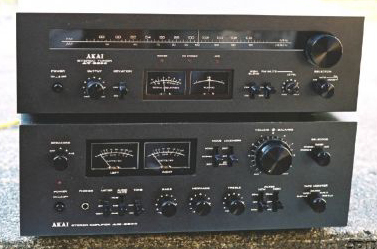 Here's a listing of the tuner's features, believed to be from Aiwa's own literature: "5-gang variable capacitor and 2 MOS FETs; quartz-controlled servo lock (defeatable); dual position IF amplifier; 12-pole LC filter in NORMAL, linear phase ceramic filter in NARROW; automatic NORMAL/WIDE selection with manual override; quartz-controlled PLL MPX; 10-element LED SIGNAL or MULTIPATH display; switchable 500 Hz test tone generator; fixed and variable outputs; 75-ohm only input; unswitched AC outlet on rear panel; manual two-step Hi-Blend and Auto/Manual Stereo/Mono switching; manual FM Muting defeat switch; digital display of frequency; flywheel slide rule tuning; brushed aluminum face plate and controls." The AT-9700U usually sells for around $100 on eBay. Our panelist JohnC provides the definitive review: "The AT-9700U is a well-built, better sounding, FM-only tuner with 5 gangs, dual IF paths, and both analog and digital station annunciators. There are several versions out there (U,E,K,H), each for a specific geographical area, with the differences being in power supply and de-emphasis. The unit is ergonomically easy to use with a fully removable bottom panel allowing trace side access to all components. "The analog front end is the same as that used in the Nikko Gamma I with the addition of an interface for the quartz-controlled servo lock at the local oscillator. The power supply, frequency counter board and front end are all shielded and located on a shelf along the back of the chassis, but more on that later. There are two independent IF paths with two Toko 6-pole LC filters in Wide and two 4-pin Taiyo ceramics marked CF-107-D in Narrow. They appear to have a different pin spacing than the usual 4-pin ceramics. Both filter paths use the same type of IF amps in the same order, 3SK40(DG-MOSFET)/2SC1923 > TA7302 > uPC1163, which feeds four uPC1163 limiter stages ending in a discretely assembled demodulator. The composite signal is then amplified and filtered going into an HA11223W MPX PLL IC. The audio signal is processed through an LPF, passive de-emph, TA7136P op-amp, then split into both fixed and variable outputs. The power supply is a balanced affair with +/- 15 V rails and isolated +12 V rails for the counter and lamps. The supply is Zener stabilized/regulated but each major tuner section employs a local secondary transistor/cap stage to isolate and decouple. These secondary stages are found feeding the front end, counter, and MPX IC with localized decoupling caps everywhere else. "The physical layout is interesting from a shielding standpoint. 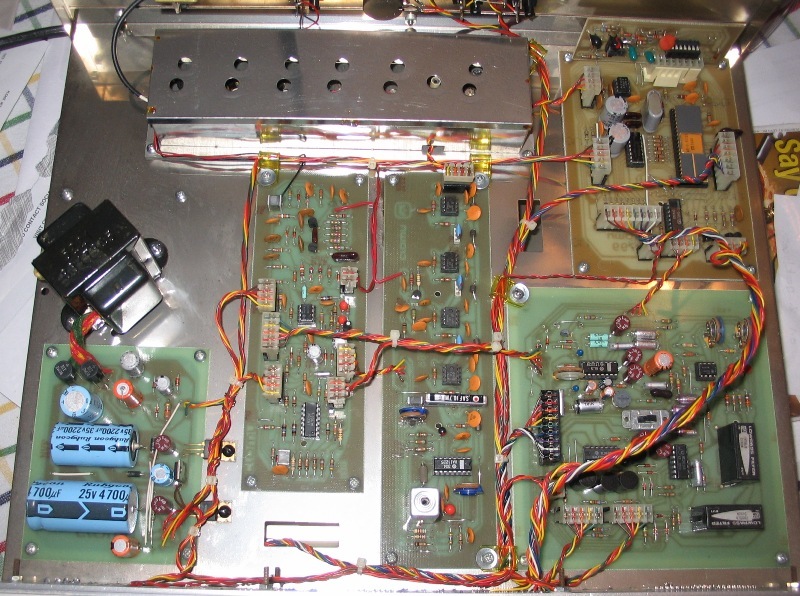 When looking into the tuner that shelf, which supports the power supply transformer, counter/servo lock, and front end, actually extends down to the main circuit board and forms a complete shield around the main power supply components and both IF strips. When looking into the box, the vertical SIP that exits this "shelf" mid/right chassis at board level is the first limiter IC with the remaining stages laid out horizontally to the left. "Those entertaining the idea of modding a 9700 will have two phases in the project, one being everything after the limiter stages, which are easily accessed with removal of the bottom plate and chassis cover. But to get to the main power supply and the IF strips requires a major disassembly of the tuner, with removal of the main circuit board to gain access to those components. It should also be noted that there are almost no component IDs silk-screened onto the board, which makes locating specific components a bit of a challenge. Since the audio 7136 op-amps are the same as those used in the Sansui TU-9900 and Nikko Gamma I, and are run in balanced mode, you can use the Bill Ammons adaptor boards to install BB OPA604 op-amps. After replacement, with the vanishingly low DC offset, the audio output can be direct coupled with removal of the two remaining coupling caps in the audio stage. So far, it sounds damn good!!" And here's JohnC's final report: "Well, the 9700 is done, and I would rank it among the best I have. The lower midrange and bass is just deadly accurate, and competes with, or bests my modded KT-7500. It also bests the TU-9900, which is interesting since they both use the same op-amps (0604s) on Ammons adapters. All three tuners have op-amps which are powered in balanced mode, and whose outputs are also direct coupled. After the updated components (caps and resistor) were installed in the de-emphasis, the high end sweetened right up. To pick up where we left off above, the power supply was rebuilt, Schottkys in the bridge and a couple of big Nichicon HEs for the caps. A matched set of Murata FALL low GDT filters were installed for the Narrow IF. Reinstallation of the board assembly went without incident and took about the same amount of time as removal. A quick power-up confirmed all was well and there was no evidence of any escaping magic smoke from any components. 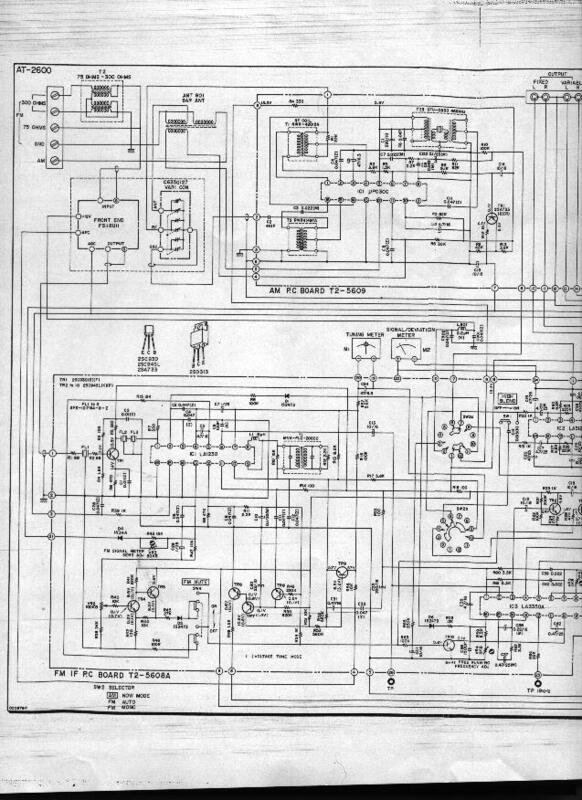 "While things were apart Ray (RFM) graciously took a look at the OEM de-emphasis circuit and suggested the following mods. The original circuit uses pots to provide an adjustment point for the de-emph. After removal and measurement of the factory caps I'm supposing that the use of the pots was dictated by the wide tolerance caps used in the circuit and the pots were implemented to bring the de-emph into spec, regardless of the size of the cap in each channel. My understanding is that using pots, especially inexpensive ones, in circuits like this will introduce phase shift anomalies and if you can use fixed resistors that will be a major improvement. 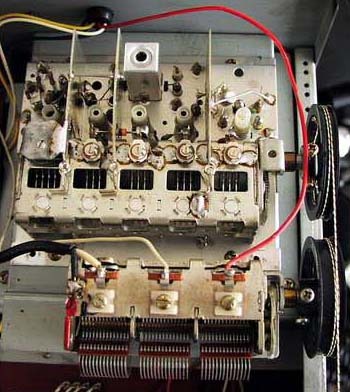 After some ciphering on Ray's part, the pots were replaced with 32500-ohm resistors with the circuit providing the rest of the load, and the caps were replaced with 2200 pf polystyrenes. Needless to say, both caps and resistors were hand-sorted and matched. "There were still some channel balance issues that were traced to the OEM wire wrap RCAs. A quick dab of solder fixed the issue but they were just too easy to replace, so in went some better, solder tab units from Parts Express, a nice fit. If there's a caveat in the 9700 update, it's the replacement filters in the Narrow IF. Even after a little tweaking, the insertion loss of the new filters must be higher than the OEM units. I've lost some signal strength in Narrow. "As for how it sounds, from the midrange down it's as good as I've ever heard in a tuner. The bass is articulate, defined and deep. A stand-up bass sounds as though you're sitting a few feet away. This is not to say that there's anything amiss in the higher frequencies. Separation, though good, is not up there with the best, but it's more than acceptable. The unit is nice and quiet and the analog station indicator is dead-on across the scale. This unit shows absolutely no drift over many days and power-ons -- you can set a station and never touch the dial again unless to change stations. Hot, cold, day or night, just set it and forget it. If you can find one, it's worth the price of admission. Not to belabor the issue, but the sound with the OEM op-amps is quite good. Replacing them with the BB OPA604s, and the removal of the coupling caps in the output, puts it over the top sonically. Thanks to Ray for the de-emph workup and doug s. for the most complete copy of the elusive service manual." 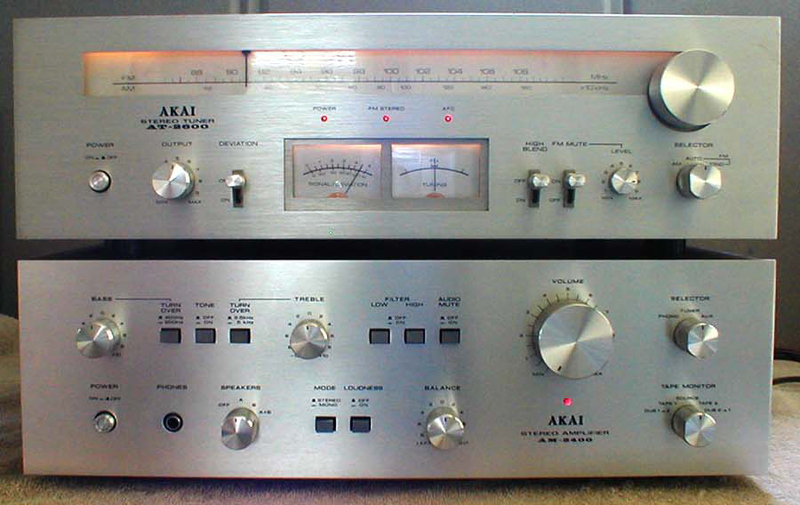 The very rare AT-93 was Akai's most expensive and perhaps best tuner. 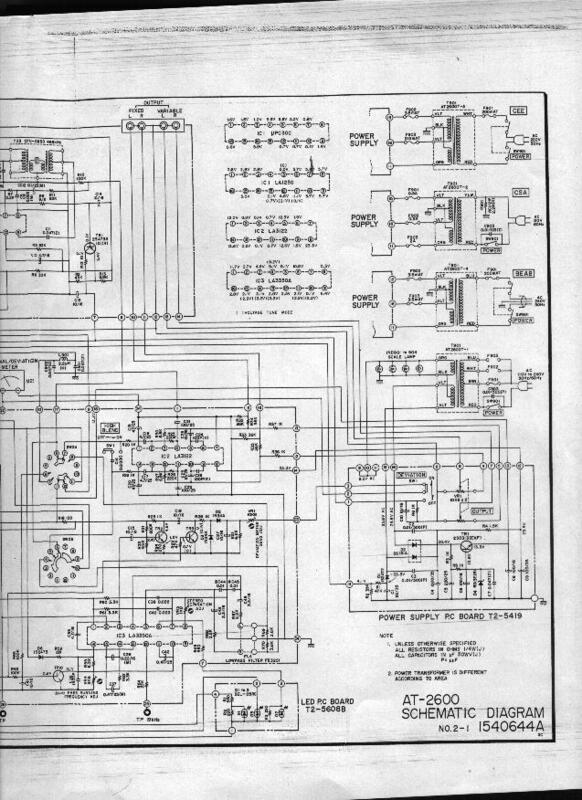 Our contributor Miklos reports, "I bought mine in Germany and it was sitting in storage for about two years waiting for me to find a schematic to change the de-emphasis to 75 µS. Since I couldn't find a diagram, I finally decided to do it anyway. The tuner has a completely discrete audio output stage, with about eight transistors in each channel. The de-emphasis is sort of a unusual one (balanced? ), requiring one to change four capacitors, instead the usual two. The unit uses quality components, like copper film capacitors - I've never seen anything like it in any other tuner. It is running now, and has heavenly sound." Our contributor Ray D. calls the AT-93 "an ergonomic and functional masterpiece: lots of functions, lots of automation and manual overrides for everything. Brilliant." The AT-93 usually sells for $250-285 on eBay, with a low of $127 in 11/06 and a high of $395 in 3/08 as two guys ran it up from $117. The AT-2600 is a scarce, underrated AM-FM tuner with 5 FM gangs, 3 AM gangs, and 3 ceramic filters for FM. Its features include high blend, a variable muting level control and variable output, and it's also one of the few tuners with a deviation meter. Most AT-2600s have a silver face but it was also available in black. Our panelist Bob says, "The AT-2600 has unbelievable sensitivity. With narrower filters installed, it would likely be a killer cheap DX machine. I think it may be the separate AM and FM tuning gangs (only on the AT-2600, not on the AT-2650) that helps. That was *not* cheaper for Akai to do. They are not built like a KT-8300, but what else is? The AT-2600 beats the pants off a Magnum Dynalab. One other point, reception sensitivity benefits greatly by removing the internal connection to the balun (snip the lead from the 75-ohm input to the balun which is also connected to the 300-ohm inputs). I would also install a coax 75-ohm connector in place of the old-fashioned one." Our contributor Don N., the Chief of the TIC Copyright Police, adds: "I have two AT-2600s, one of which was modded. It comes in very close behind my KT-7300 for sound and knocks the pants off it for tuning capabilities. Pegs the signal-strength needle on almost every station across the board in my area (Seattle)." The AT-2600 usually sells for $70-125 on eBay, with a low and high of $50 in 10/08 and $200 in 12/07, respectively. The AT-2650 is another underrated 5-gang tuner. Our panelist Bob's comments about the build quality of the AT-2600 apply as well to the AT-2650, although it lacks the AT-2600's separate AM and FM gangs. The AT-2650 usually sells for $80-125 on eBay. "The front panel looks just like the AT-V04 with a larger tuning knob minus the presets, search and different muting levels. It seems to use exactly the same display and tuning lights. Tuning is indicated in 0.05 MHz increments like the V04. The controls are very basic: AM, FM, and stereo/mono that also controls muting. At the back there is a Local/Distant switch. The unit itself is quite heavy and solid. I had found out that the V04 and K03 share the same service manual so I hoped that the K03 might just be a V04 without the presets, which would make it a major bargain. I plugged it in and it seemed to have decent sensitivity, though nothing special, and it did not like my DIY square loop antenna. Then I realized that the rear switch was set to Local and the signal was being greatly attenuated. Setting it to Distant improved things greatly, as pretty much everything came in strong and clean. Sound quality is on the mellow side. Not terribly strong or extended in the highs compared to my better models, but when not doing an A/B comparison it sounds quite nice and warm on its own - a nice, relaxed listen. Downstairs it managed to get Vermont Public Radio in stereo when my Sony ST-J75 could only get it in mono. On the poor signal in the basement there was some noise, but more of a tolerable hiss than the warbles and whistles that most other tuners produce. Obviously the K03 is quite sensitive. "The cover is amazingly heavy. I am not sure if that is a sign of great construction, or just a reflection of the fact that sheet metal might have been cheaper than electronic components when this tuner was made. I say this because I was surprised to find a very simple tuner with little in common with the AT-V04. The AT-K03 looks to be well made and quite tidy, but it seems to have only 3 gangs. Caps are mostly UCC with a few mylars. 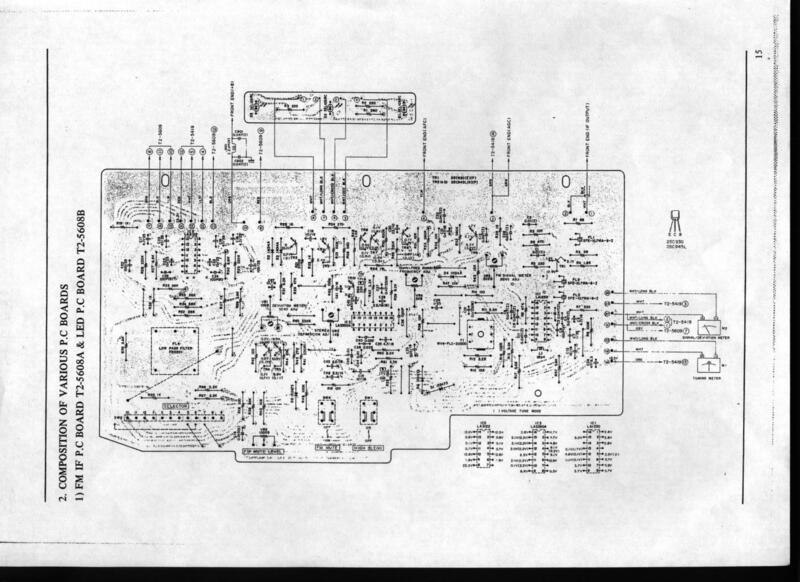 Lots of transistors, 25 or more. I found the following chips, all Sanyo I believe: LB1405 J3, LA1240 J1, LA3380 J4, and A1 231N J3. There is a low-pass filter marked 3368 8038V. The main board is labeled Akai ATK-2001A. This seems to be a very basic all-analog tuner with a digital display. Maybe it is more like the analog AT-K02 than the AT-V04. Given how simple it is, I wonder why it works so well? It is very nice to listen to, quiet, very sensitive and easy to use." The 4-gang AT-V04 is a fairly common FM/AM digital tuner that was considered close to state-of-the-art by some FM DXers in the early 1980s (if one excludes the Mac MR 78). Our contributor Marcus tells us that the AT-V04 tunes in 0.05 MHz increments for FM and 1 kHz increments for AM (highly unusual and great for AM DXers) and has 7 presets for each band. It claimed an excellent 1.6 µV IHF sensitivity on FM and, with alternate channel selectivity of only 75 dB, might be a good candidate for a filter mod. Stock, it has 3 blue GDT-type ceramic filters. Our panelist Bob says the AT-V04 is "possibly the only cheap digital with a full analog feel. Not like the analog knob digitals - it is truly full analog tuning, like a Magnum. It goes into analog mode to tune off-channel. The front panel has a high-quality look and feel, all metal with metal buttons and knobs. The controls feel solid. There is a mini flywheel and tuning string inside, really cute as it is so small." There are buttons for two levels of muting on the front panel, and the back panel includes antenna attenuation switches (local/distant) for both FM and AM, and muting level and output level adjustments. 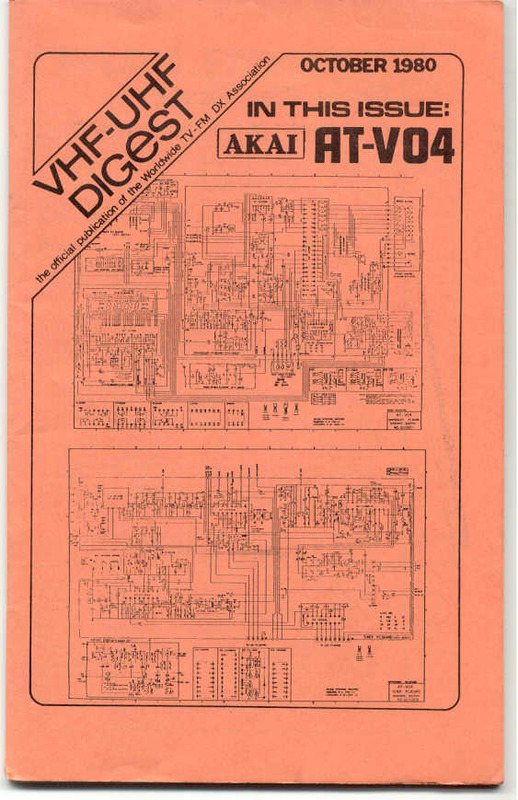 A 1980 review of the AT-V04 by an FM DXer may be found here. The AT-V04 usually sells for $35-75 on eBay, with occasional lows of $10-20 and a high of $128 in 6/07. A rare black AT-V04 went for $138 in 12/04. 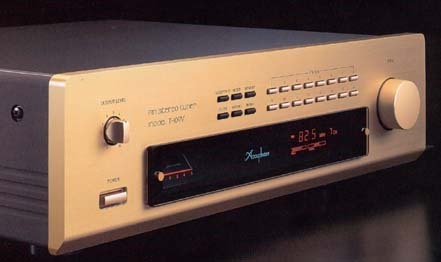 This excellent-sounding FM/AM digital tuner was the only model ever sold by Amber, a small Virginia-based high-end audio company. The Model 7 tuner was manufactured by Rotel and our contributor Sam tells us it is "a repackaged Rotel RT-860 with some repositioning of the front buttons." A service manual for the RT-860 is available at HiFiEngine.com and our contributor Dave P.'s analysis can be found in our RT-860 writeup. The Amber is extremely sensitive in mono but could be quieter on weak stereo signals, according to the original Stereophile review. 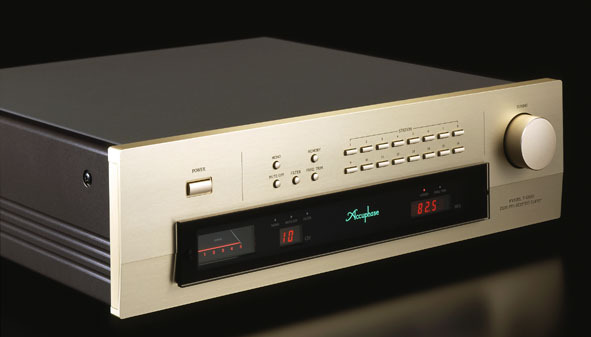 In fact, in their well-known "Seven FM Tuners" report, Stereophile gave the Model 7 a grade of A ("the best available") for sensitivity, as well as an A for "stereo image and separation" (the other grades for the latter criterion were: McIntosh MR 78 - B, Luxman TX-101 - B, Onkyo T-9090 - C, Adcom GFT-1A - C, and Carver TX-11 - D). The Amber is unusually attractive, with solid wood (we thought teak, but see Ron's comment below) end caps rather than the typical veneer. It has only 6 FM and 6 AM preset buttons, so those in large metro areas who like to memorize 27 stations need not apply. The tuner has the electronic equivalent of 4 gangs, but only two ceramic filters. In stock form, adjacent channel selectivity is poor, and the Amber should be considered a tuner for audiophiles and not DXers. 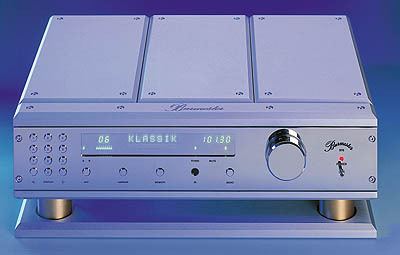 In our panelist Jim's view, the sound is neutral with bass a little lighter than a stock Kenwood 600-T but better than a stock Kenwood KT-7500, and the treble is smoother than most older transistor tuners. The audio quality may be due to the short signal path and the audio circuit being so close to the output jacks. A contributor named Ed in our FMtuners group disagreed slightly with Jim: "On my sample, the bass is anything but light. I can't imagine any other tuner having fuller and/or heavier bass, but I'm sure there are. My Model 7 is very authoritative when it comes to the low-end extension." Our contributor Ron J. wrote, "I've finally gotten around to fixing the Amber Model 7 I acquired some time ago. Despite seemingly no available information schematics or alignment procedures, I managed to muddle my way along and am quite happy with the outcome. While I can't consider this one of my 'best' tuners in this location, were I to live in a more urban area where sensitivity is not quite as important an issue I'd have no trouble keeping this one on the shelf. Unfortunately the stations I like to listen to most are very distant and at times present difficulties for my most sensitive tuners. My impressions of the tuner otherwise: While obviously inexpensive design-wise, this is most definitely one of the best-sounding tuners out of the box to cross my bench. It's easy on the ears, and I never 'tired' or found the sound irritating. If its close cousins of the time, some of the Rotel line, sound like this, there may be a whole new line of sparrow feed. Frequency response is quite accurate through the upper midrange, neither lacking in nor having the bass boosted, though some seem to like the latter. I can only fault the early roll-off on the upper end. I should add that I did not try to adjust it out through the uncommon adjustable low-pass filter this tuner uses. There's probably a trade-off between blocking the pilot as well as it is and losing a little of the top end of hearable audio. This tuner sounds and has a sensitivity pattern a lot like the Mitsubishi DA-F20. I'd also compare it closely to some of the Sansui tuners of its time. "This is a rather inexpensive design, 4-stage varactor tuning followed by an IF amp stage and two non-GDT Murata filters. This is followed by a Sanyo LA-1231 Quad Detector-IF amp, followed by the Hitachi HA1196 for MPX. From there the output is basically bufferless, passing only through a nice discrete and adjustable low-pass filter stage, and a Sanyo/Panasonic Pop-Noise reduction AN6135. The AN6135 outputs the signal at unity to a slight gain only. One thing that probably was not cheaper for the manufacturer was the use of all Nichicon caps, save for a few styrenes used in the audio stage. For once I can say I think the noise reduction actually works, in particular on quieter signals. I have a hard time quantifying it with my ears but the scope says there's a difference. In total, the combination of bufferless output, noise reduction and discrete components where used are responsible for the good sound. The addition of a handful of quality caps in the audio section and perhaps a filter adder board in the IF ought to make this into a much better tuner. In the negative column -- perhaps due to age, perhaps due to inexpensive design -- this unit seems to have quirks with the control of tuning and with cold solder joints. Automatic tuning will occasionally lock up at the top end of the dial rather than either coming around to the low end or just stopping. The cure is easy enough, though -- only resetting (powering off) the unit. This does not happen under manual tuning so it is either an aged chip or a design issue." Ron also notes that the Model 7 "came in either a silver or black-faced version. Someone had mentioned thinking the sideboards were solid teak, but my nose tells me they're solid walnut." The Model 7 usually sells for $50-130 on eBay, with a high of $191 in 8/07. Our panelist JohnC reports: "The T7 is a single-IF, AM/FM tuner with 30 presets and is remote capable. It was designed/engineered in London/Los Angeles and manufactured in Taiwan under the AMC International Quality Standards, and the parent company is Weltronics Corp. My initial impression was that this is a pretty good-sounding model. Compared to the recently auditioned Denon TU-460, the T7 is quieter and a bit more selective. The spec sheet indicates a S/N ratio of >74 dB, carrier suppression (19 & 38 kHz) 60 dB and .08% THD @ 1K. The front-panel layout is clean -- some might say spartan. Power button, Preset Input, Memory, Band, Mono, Auto and Manual tuning, and that's it. The T7 tunes in 200 kHz increments and its digital display includes a center-tune indicator similar to the Mitsubishi DA-F20's. The T7 images well with good separation, frequency extremes are more than acceptable, long-term listening is comfortable with no apparent brightness, and it has decent-but-not-great bass. The remote provides only band selection, tuning and preset selection. Power On and preset programming still have to be done at the tuner itself. "Pulling the cover makes one wonder how this thing actually works. In comparison, the T7 makes the Denon TU-460 appear downright crowded, and the 460 is an empty box. The T7's tuner board, which includes the power supply rectification, measures a little over 6 x 4 inches. The tuner appears to be well made, with a double-sided board, glass substrate, polystyrenes in the de-emphasis, and through hole plating for the components, which may halt any thought of ever modding the T7. The Mitsumi front end is a 4 gang (thanks Jov and Don) equivalent varactor, followed by a 3 ceramic filter IF strip. The AM/FM IC is the Sanyo LA1266 which feeds an LA3401 MPX services IC, with no audio buffer in the output. There is a 7a version of this tuner but I haven't had the opportunity to pull a cover and see what changes were implemented there." Our panelist Bob adds this observation: "I don't see any trim caps for the 4 gangs. Usually on most tuner front ends there are as many adjustment caps as there are adjustable coils, one pair of each for each gang. This means alignment may be somewhat compromised on the ends of the FM band, as you are forced to make all adjustments mid-band at 98 MHz in this case, where you have only coils to adjust (and adjustment is by bending)." The T7 and T7a usually sell for $40-80 on eBay (with a low of $10 in 4/09 for a T7a with no remote). The 4T2 is a very rare tuner that was seldom seen in the secondary market until an eBay seller sold off a large stash of "new old stock" pieces in 2007-2008, and some of those same units have been in circulation since. Please post in our FMtuners group if you have any information about the 4T2. The 4T2 usually sells for $210-285 on eBay, with a low of $179 in 10/08 and a high of $381 for a new one in 8/08. Please post in our FMtuners group if you have any information about any Arcam (A&R Cambridge Ltd) tuner. We're tracking eBay sale prices for a couple of them in the On-Deck Circle. We don't know much about the T-200 but our contributor Keith tells us that it apparently "used the same circuit board as the dbx TX-3 MkII. The MkII has some additional features for other dbx components, such as remote control link, and also includes a frequency step adjustment that the T-200 lacks. Some specs on the T-200 are: usable sensitivity 9.4 dBf Wide, 15 dBf Narrow; capture ratio 1.5 dB; stereo separation 39 dB at 100 Hz, 41.5 dB at 1 kHz and 37 dB at 10,000 Hz in Wide, and 47/50.5/48 dB in Narrow; S/N ratio @65 dBf Mono 83, Stereo 78.5; image rejection 132 dB; frequency response 20-15,000 Hz +0.6, -0 dB. Listening impressions: this is a very quiet tuner. A very well-balanced soundstage that extends beyond the speakers, with a slight forward character. Deep bass with smooth extended highs. A very natural, dynamic sound. I very much prefer it to the Kenwood Basic T-2, which has a more laidback, reserved sound, with a slightly less punchy bass. The T-200 in Narrow sounds similar to the Kenwood in Wide. Maybe the Kenwood needs an alignment. "The T-200 has a nice heavy front panel, with high-quality feel switches, and a very smooth rotary tuning knob. It also has scan up and down and a center tuning meter with opposing arrows (red) and a green indicator that lets you know you're locked on. It incorporates auto IF switching that can be overridden but only to the narrow position, very odd. The good news is that the tuner always seems to choose the right setting for lowest distortion and noise. It also has separate stereo/mono and mute buttons. The switchable Schotz noise reduction circuit works well - I usually leave it on, as it only comes into play with signal levels less than 55 dBf. Very easy to use, with little fiddling required. The AM section is a bit of a disappointment. Although it has a very extended range, it seems to be susceptible to electrical interference in the house, whereas the Kenwood is extremely quiet and sensitive as well. The Kenwood T-2 has a outstanding AM section with a slider IF adjustment, so I'm keeping the Kenwood for AM listening. The T-200 appears to be a great value at current prices. I paid less than $35 for two of them. I can't attest to DX capabilities, since I only use a deck-mounted dipole antenna, which works well for me for now." The T-200 usually sells for $40-80 on eBay, with a low of $30 in 9/06 and a high of $100 in 5/04. We know even less about the T-2000E than we know about the T-200. Please post in our FMtuners group if you can tell us about it. Here's a review of the T-2000E from Audio magazine. The T-2000E usually sells for $50-80 on eBay, with a low of $10 in 5/05. Our panelist Jim tested this unimpressive-looking black digital, made by Cambridge Systems Technology Ltd., and called it "a wonderful-sounding tuner." See how Jim compared this 8000T to other top tuners on our Shootouts page. Our contributors Tim and Ann warn, "We subscribe to most of the major UK publications and virtually all of them have noted serious reliability problems with this model. The specific problem these magazines noted was a logic board failure and once this board failed, the tuner ceased to function. And these boards are no longer available." The 8000T only comes along a few times a year on eBay and usually sells for $300-610, with a high of $894 in 3/05. Please post in our FMtuners group if you have any information about this scarce tuner. It looks pretty flashy, but we believe it's mostly an "empty box" inside and not worth the $150-200 that it can fetch on eBay. The ST-3120's lesser sibling, the ST-1120, has sold for $5-10 on eBay. CAUTION: This is a mediocre (or worse) Korean-made tuner that seems to turn up most often in Canada. It sometimes sells for high prices, presumably because buyers are confusing it with something else. All we know is that it has 3 gangs for FM and 2 for AM, certainly not what you'll find in a top tuner. Please post in our FMtuners group if you have any information about it. The last few ST-2000s we've seen on eBay have gone for $141 in 4/07, $56 in 12/08, $255 in 4/09, $26 in 6/09 and $170 in 2/11 (guess which buyers didn't read our caveat). Please post in our FMtuners group if you have any information about any Audiosource tuner. We're tracking eBay sale prices for a few of them in the On-Deck Circle. The TS-108 is a very attractive tuner that our contributor Ed Hanlon tells us was the predecessor of the Fanfare FT-1. Ed says the TS-108's "ergonomics left a lot to be desired, but it performed superbly with some basic mods. B&K stopped selling the 108 when Fanfare took the tuner and added balanced outputs, remote, etc." Ed adds that a TS-108 modified with narrow filters "can be a DX machine, and can sound darned good too." Our panelist Jim tours the inside of a stock TS-108 with a circuit board dated 9/20/91: "There are three ceramic filters that appear to be Toko, marked CER 1, 2 and 3. The markings are SK4MH on CER 1 and SKM2C on CER 2 and 3. There are four IC's inside and, moving left to right, we see an LM1865N advanced FM IF system, LM4500 MPX chip, LC 4966 Sanyo Quad bilateral switch and an Analog Devices brand AD712 high-speed bi-FET as a buffer after the LPF. This buffer has no negative supply. There are two 10 µF NP electrolytic caps after the MPX and two of the same after the AD712. All in all, a valiant attempt at good sound in a small package and fairly successful, IMO. Tuning down the dial is very slow but eight stations can be stored in presets. There is a wide/narrow switch, and a switch marked DX that always increased signal strength when used." See how one TS-108 sounded compared to other top tuners on our Shootouts page. The TS-108 usually sells for $130-190 on eBay, but as low as $75-90 is possible when sold "as is." A rare gold-faced TS-108 sold for $200 on eBay in 7/04. 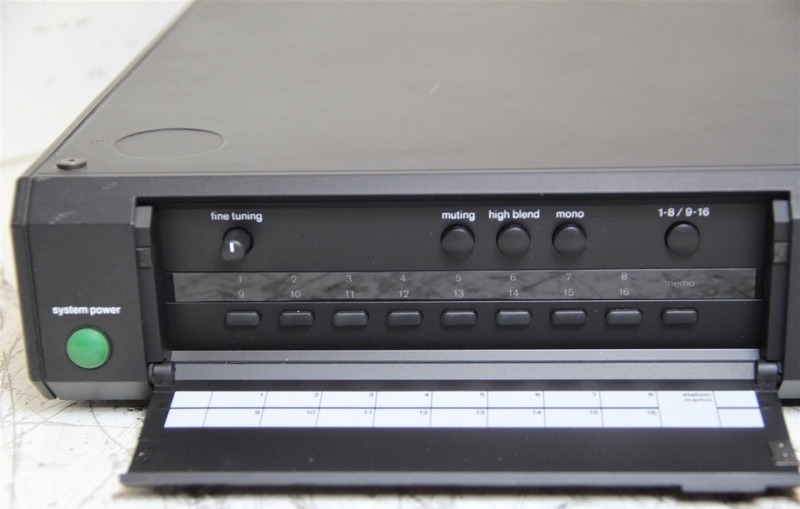 Here's a review of this rare German tuner by our contributor Jov: "The 915, an FM-only tuner, was sold from 1991 to 1997. It features a machined 7 mm thick machined and polished stainless steel front panel that weighs 1.5 kg. The tuning knob, also made of machined stainless steel, weighs 250 gm, giving it that nice flywheel effect. The rest of the chassis is made of anodized black aluminum panels held with Allen screws. Inside the 915 are five PC boards, namely the antenna switch, RF module, IF/detector/MPX/buffer, power supply, and finally the main control. With the exception of the antenna and RF module, the remaining boards employ plated-through hole double-sided FR4 material with red solder mask. Most of the modules are separated by steel walls, with the RF module fully encased in a steel shield. The main control is located behind the faceplate away from the noise-sensitive areas. The power supply sits behind the main control with its own steel shield. "The power supply employs a toroid transformer with a 115/230 volt line selection via jumper wires. The power supply board has a total of 39,270 µF of filtering distributed on four different voltages. This total capacitance excludes the separate filtering on the IF/Detector/MPX/buffer board which is at least 54,400 µF (8 x 6,800 µF) total. At the PAL antenna inputs, a relay is employed to switch between antennas A and B. Antenna input B has a 10 dB pad. "The front end has 6 gangs total, with the following arrangement: 2-gang + dual dual-gate GaAs MESFET RF amp + 3-gang + dual dual-gate MOSFET RF amp + LO. The mixer used BJTs configured as a balanced mixer. After the mixer are a mix of 15x IF transformers/equalizers/inductors and 2x 6-pole Toko linear phase LC filters. The 915 has only one IF bandwidth (110 kHz). Tuning step is selectable between 10 kHz and 50 kHz. Going from the lowest band to the highest band is quick using the heavy tuning knob. Signal strength is done via 12-step LED display. Memory station backup is through a lithium cell held on a holder. This is a nice feature and allows the end user to replace the worn cell without any soldering. There is a remote control option for the 915. "The FM detector is a double-tuned quadrature IC. There's a factory option for the DYNAS system and around the FM detector circuit are provisions for a daughter board. The front panel has a dedicated DYNAS button. Without the DYNAS installed as an option, depressing the button will mute the audio as it engages to something that isn't present :). The FM detector then feeds two separate MPX decoders, each of which has its own 190 kHz notch filter at the composite input which make this tuner immune to IBOC crap. The MPX outputs goes through the pilot and subcarrier notch filters, then to two pairs of discrete DC-coupled buffers. There are 4x film capacitors (and no electrolytics) used for audio coupling located at the MPX input and outputs, respectively. The audio outputs support both balanced and unbalanced configurations. "Measured stereo separation was over 70dB @1 kHz, and noise is quite low at 90 dB down unweighted. One thing that is interesting was that most of the discrete part numbers on the DC buffer area had been sanded off. It doesn't take that much effort to figure exactly what they are. The newer Burmester 993 was a lot worse in this regard -- all the IC part numbers were sanded off, including the 3-pin IC regulators!" Jov adds: "The 915 sounds smooth, non-fatiguing and has a very wide sound stage. The 993 is not as good as the 915 in terms of sound." The FM tuner 978 is our flagship product in the tuner market. Even in comparison with its already legendary predecessor, the 915, the 978 offers further dramatic improvement in sound quality. The German magazine Audio called it "divine" and uses it as reference tuner. Why offer an FM tuner of this quality and price level in a restless world dominated by digital audiosystems? A justified question - but then, think about those constantly changing digital recording and broadcasting standards, some of which have been much-touted but long in coming and some of which have already disappeared again, such as the DSR standard. In the final analysis only an FM tuner offers unrestricted access to the virtually unlimited supply of recorded music broadcast by radiostations. The 978 also proves convincingly that the perfect reception of an FM station via cable can be an exhilarating musical experience. With its totally re-designed Burmester front end, the 978 offers a sound quality and musical enjoyment never before heard from FM broadcasts. The front end has been completely developed in-house through intensive research and built with only highest-quality parts. Using our own technology we were able to realize the excellent-sounding wide-IF solution with 400 kHz bandwidth. The 978 is available in two models: As 978 Top Line Tuner in our top line housing with a 482mm wide front panel and as 978 Reference Tuner with a 450mm wide front panel in our extremely sophisticated reference housing. Both are characterized by clean design, high-grade material and excellent Burmester-typical uncompromising manufacturing quality. The T500 has a silver face and a blue back-lit LCD display. Our panelist Jim got to play with one and ranked the sound of that sample in comparison to many top tuners on our Shootouts page. The T500 usually sells for $75-85 on eBay, with a high of $164 in 5/07. Our contributor Bill C. compared his PSB-11 to his TX-11b and says they're identical except for the color, black for the PSB-11 vs. dark gray for the TX-11b. We trust Bill's word despite statements on other websites that the PSB-11 is identical to the TX-11a, so the TX-11b writeup below should apply equally to the PSB-11. The PSB-11 is extremely rare and is seldom offered for sale on eBay and other sites. The FM-only, 6-gang TX-11 was a favorite of some DXers in the '80s (here's a 1983 review) and had a reputation for being very quiet in mono on weak signals. Back then, very few knew about filter modifications, and a tuner with great adjacent channel rejection was a revelation (until the Onkyo T-9090 came out in 1984, the McIntosh MR 78 was about the only other option for DXers). Although there are always those with differing opinions, the majority now find the TX-11 mediocre-sounding or worse in stereo, with poor separation. Our contributor John V. adds that the TX-11 has "fair to decent bass, but the top end sorta sizzles - no real extension or details." Our own view is that most good vintage tuners are only one or two narrow filters away from being as good as, or better than the TX-11 for DXing, while also satisfying audiophiles. As to the possibility of modifying a TX-11 for improved sound, our DIY audiophile panelist Jim owned one for awhile, but "wasn't impressed with the sound and looking in on those multi-tiered boards of digital madness made me back off trying to improve anything." Our contributor Girard, the proprietor of the DXFM website, likes the Denon TU-1500RD and Onkyo T-9090II for DXing but says, "I think the worst of the 'big name' tuners I tested here was the Carver TX-11. It has great specs when connected to a communications analyzer, but it sure went to H*** when exposed to the signal levels I have at this location." DXer Bill N. says, "The TX-11 was a great DX tuner for its time except that it had a really funky echo when making stereo signals sound static-free. The tuner itself was very sensitive and OK for overload (not great) and so-so for selectivity unless you replaced most of the filters. Problem was that replacing the filters made the S-meter useless (it always showed full scale or close to it). Also, it had a ton of front-panel presets. I sold mine when I moved under the transmitters in Hartford as it just couldn't handle the overload." Our contributor Richie points out that the U.S. version he owns has larger, easier-to-see LED lamps than his Japanese model, and the U.S. version's sensitivity is better. The TX-11 usually sells for anywhere from $50-125 on eBay, but even lower is not uncommon (the all-time low is $28 in 9/09). Someone who didn't read this review paid $256 for a mint one in 10/03, and one poor guy paid $375 for one in 4/02 that had a sticker on the box that said: "Latest Circuit Refinements. All Sonic Improvements." What does that say about the audio quality of an "unimproved" TX-11? This pricier successor to the TX-11, among the few tuners with AM stereo capability, apparently featured improved sonics on FM as well. Our contributor Noel reports: "I talked to the Carver people about the differences between the various TX-11s. They said forget the TX-11, Carver put a lot more in the audio stages in the TX-11a, and really put all they had in the TX-11b." Our contributor Lance says, "I was shocked at how much better my Carver TX-11a sounds/receives compared to the Nakamichi ST-7." Our contributor Richie, who wanted to listen to a noisy weak station, adds: "I sold my [Sansui] TU-919 and got a mint condition TX-11a. What a difference. It pulled in that station nearly noise-free and when pressing in the multipath noise limiter it's as clean as new linen, without killing the stereo separation. It's one quiet tuner and it looks good too. Critics say the sound is mediocre -- I say it sounds great and crisp." John Byrns says, "The AM reception of the MCS 3050 is better than the TX-11a - it doesn't have the high noise level of the TX-11a. Unfortunately, the sound of the MCS 3050 is very gritty and sibilant on both AM and FM, while the sound of the TX-11a is undistorted save for the background hiss." The TX-11a usually sells for $150-215 on eBay, with a record low of $57 in 4/09 and a high of $305 in 2/08. Wide: 250 kHz ceramic filter - amp - LC - amp - LC - 250 kHz CF - amp - detector. Narrow (before Wide): 180 kHz CF - amp - LC - 180 kHz CF. LA1235 detector IC. LA3401 MPX IC. LC4966 output buffer IC. The MPX has switchable 50 µS/75 µS feedback de-emphasis. Wide: amp - LC - amp - detector. Narrow (before Wide): amp - LC - 450 kHz CF. "The FM noise and multipath reduction all appears to be done in the audio circuit realm as is the Schotz noise reduction, but it seems FAR more effective. AM performance and sound are also pretty special but in Wide mode it lets in adjacent stations. Two complaints: At its price Carver should have added a digital signal-strength meter, and the gray letters and numbers on the black dashboard are very difficult to read. Come on Carver, white, hunh? Still, ol' RFM really likes this Carver creation and it has found a spot both in his rack and in his heart." Here's a follow-up from Ray: "I pulled the noise reduction board off the top of the main board so I could run a frequency/de-emphasis response test. No surprise here as the results were very good. It's accurate to the 75 µS curve to +/- 0.15 dB from 20 Hz to 10 kHz and is down 0.95 dB at 15 kHz. The -3 dB point was 2139 Hz giving a time constant of 74.4 µS. The tuner's audio signal output polarity is in phase with that received but is flipped at the detector out. I see no reason to add a detector out jack to this tuner. Surprisingly the FT-5500 MKII does top the Carver in AM reception. The Carver's wide bandwidth, even in Narrow mode, lets in adjacents too much, especially at night when all signals are strong. The upside, of course, is that when not interfered with the sound is very good, even pushing FM on local or clear channel stations. The Hitachi sounds nearly as good in AM Wide but is much more selective when in Narrow and sounding more like typical AM." Bill C. says, "The TX-11b is a very good sounding and performing FM tuner. Sensitivity is excellent and the Carver noise reduction circuitry is second to none, at least for any tuner I own or have directly listened to. Sound quality is not in my top 5, but certainly in my top 10 list. Now for the real reason for this report: The AM sound quality on the TX-11b is absolutely the best of any tuner I own. My town has a decent oldies Top 40 station, 1600 WPDC, yet I rarely listen to this station on the FM tuners I have with supposedly good AM tuners because the sound quality is only a couple of steps above what you can hear over the phone line. The audio bandwidth of these tuners is just too narrow. Well, not so with the TX-11b - in Wide mode it sounds great. In my location, there are no other stations near 1600 kHz so there is nothing to interfere with the Wide mode setting. Even though the U.S. AM audio bandwidth spec is something like @20 Hz to 10 kHz (vs. FM's @20 Hz to 15 kHz), the Carver must be getting everything out of that since it sounds so good. The TX-11b also has C-QUAM stereo capability, but unfortunately WPDC is mono. Last night I compared my heavily modded Kenwood KT-7550's AM to the Carver's and the comparison was embarrassing for the Kenwood. My final point: If you have access to decent music programming on AM and want to get the most out of it, as well as damn good FM, then the TX-11a, TX-11b, or PSB-11 should provide this better than just about anything else you can get hold of." Our panelist Eric adds, "The TX-11b is really a nice tuner, especially the little bells and whistles like noise reduction, multipath and AM noise limiter. On AM it is a star; on FM it is just about as sensitive as the Sony XDR, and selectivity unmodded is fine for all but the strongest adjacents. There is even one fringe station, on 100.1, on which the Carver quiets significantly better than the Sony. I looked all up and down the band for another case where the Carver was quieter but couldn't find one, so I can't explain that." Our contributor Brian Beezley has a detailed review of the TX-11b on his website. The TX-11b usually sells for $250-400 on eBay, but seems to provoke bizarre behavior in naive bidders: three spendthrifts ran up the price of a TX-11b in a sealed box from $300 to $960 in 11/03, and in 1/04, two nuts chased each other from $309 all the way to $775. See how one TX-11b sounded compared to many top tuners on our Shootouts page. The Creek 3140 is a British tuner that is fairly rare in the U.S. According to our contributor doug s., the 3140 is "a really nice-sounding and quite sensitive analog tuna with digital readout, for not a lot of scratch. Quite diminutive in size, as well. It has a local/DX switch, wide/narrow band, stereo/mono, AFC on/off, and an auto-blend circuit." Our contributor Ray D. says, "Neat little tuner. Few buttons, but everything you need is there. Lots of clever automatic circuits, according to the manual, and great touches like the fact that the display intensity changes with signal strength." Ray compared his 3140 to a Meridian 204: "The 204 sounded livelier pretty much right off the bat. More detailed highs, perhaps a bit forward which is surprising to me for a Meridian product. Maybe the Creek is a bit laidback. The low end on the Creek was surprising, about as good as the 204, but overall the 3140 had less of a sense of space and a smaller soundstage. Still a very good performance given that it was about one-quarter of the price of the 204 when they were sold new. The Creek is a very good-sounding tuner on its own. I can't help but wonder if it might sound even better with 4X more output from the DIN socket as the RCA outputs have only 150 mV output compared to 550 mV for the DIN. Oh yeah, the RCA sockets are undersized and heavy cables tend to fall off if touched - annoying." Ray also found the 3140 slightly less sensitive than the Meridian. The 3140 usually sells for $75-110 on eBay. The FM1 is a 6-gang, FM-only tuner with 3 ceramic filters and one "SAW" (Surface Acoustic Wave) filter, like those used in some of the better Kenwood tuners. It was designed and built for Crown by Draco Labs, best known as the manufacturer of the mammoth Sherwood Micro/CPU 100. Our contributor Dave N. observes that the FM1 has variable outputs with independent controls for the left and right channels, and a mute adjustment on the back along with multipath outputs. The ceramic filters are socketed rather than soldered, so it would be easy to swap them out for narrower ones. Our contributor Jov analyzed the service manual: "The FM1 uses quadrature detection using the common CA/LM3189 IC compared to the pulse count detection (HA12401) in the FM2. The first thing that I've notice is the presence of too many IC sockets in the FM1 design. If the tuner were mine, I would get rid of all these sockets. I'd also remove the ceramic filter sockets. Sockets add stray inductance and capacitance on high frequency circuits aside from the long term reliability issue. The internal wiring looks tidy but is not necessarily the best approach in terms of minimizing noise. The MPX board PCB layout has a very limited ground plane compared to the rest of the boards. I also noticed the 7-segment display wires running directly on top of the MPX board's gain blocks. This could explain the not-so-good spec of -65 dB hum and noise. Crown used non-audio grade CMOS bilateral switches (MC14016/CD4016) in the audio path for muting and MPX noise filter. These can be upgraded to Sanyo's LC4966. These are just my impression of the internals and I don't own one." Our contributor Walter reports: "I borrowed the FM1 for a week to see if I wanted to buy it for myself. This was 1982, and all I had was an indoor Yagi with no rotor. It pulled in stations that the Onkyo T-4055 could only dream about. The FM1's controls and general build quality said military or laboratory spec. The sound was also chilly and antiseptic like a lab. I could have snagged it for something like $375, but I passed. No other Crown experience." The FM1 usually sells for $280-400 on eBay, with lows of $102 and $114 in 10/08. The all-time high was a stunning $1,153 in 10/03 for one with a manual, and a damaged one even sold for $710 in 1/04. Please post in our FMtuners group if you have any information about the FM2 or FM3. The FM2 is an FM-only tuner, and the FM3 is FM-AM. The FM2 usually sells for $150-380 on eBay, with a high of $502 in 2/05. The FM3 is rare and we've seen it sell on eBay for $257 in 7/07, $455 in 11/07 with a wood case and $162 in 11/08.